HYPONATREMIA (SERUM SODIUM LEVEL LESS THAN 134 MMOL/L) is a common electrolyte disturbance. Its high prevalence and potential neurologic sequelae make a logical and rigorous differential diagnosis mandatory before any therapeutic intervention. A history of concurrent illness and medication use as well as the assessment of extracellular volume status on physical examination may provide useful clues as to the pathogenesis of hyponatremia. Measurement of the effective serum tonicity (serum osmolality less serum urea level) is the first step in the laboratory evaluation. In patients with normal or elevated effective serum osmolality (280 mOsm/kg or greater), pseudohyponatremia should be excluded. In the hypo-osmolar state (serum osmolality less than 280 mOsm/kg), urine osmolality is used to determine whether water excretion is normal or impaired. A urine osmolality value of less than 100 mOsm/kg indicates complete and appropriate suppression of antidiuretic hormone secretion. A urine sodium level less than 20 mmol/L is indicative of hypovolemia, whereas a level greater than 40 mmol/L is suggestive of the syndrome of inappropriate antidiuretic hormone secretion. Levels of hormones (thyroid-stimulating hormone and cortisol) and arterial blood gases should be determined in difficult cases of hyponatremia. Hyponatremia (serum sodium level less than 134 mmol/L) is a common electrolyte disturbance occurring in a broad spectrum of patients, from asymptomatic to critically ill.1,2 There are serious neurologic sequelae associated with hyponatremia and its treatment. Therefore, a logical, rigorous differential diagnosis is mandatory before therapy can be begun.3,4 Since hyponatremia is caused primarily by the retention of solute-free water, its cause encompasses disorders associated with limitation in water excretion.5 The principal causes of hyponatremia are summarized in Table 1. As with other electrolyte abnormalities, the history and physical examination can provide important clues toward the correct diagnosis. In most cases the initial laboratory evaluation includes measurement of serum osmolality and urine osmolality (by osmometer if available), urine sodium concentration and serum levels of other electrolytes (potassium, chloride and bicarbonate) as well as serum concentrations of urea, glucose, uric acid, total proteins and triglycerides. In addition, determination of serum levels of thyroid-stimulating hormone and cortisol is important to exclude any associated endocrinopathy (Table 2, Fig. 1). Measurement of arterial blood gases is also useful in the differential diagnosis of hyponatremia, particularly in patients with abnormal serum bicarbonate concentrations. Fig. 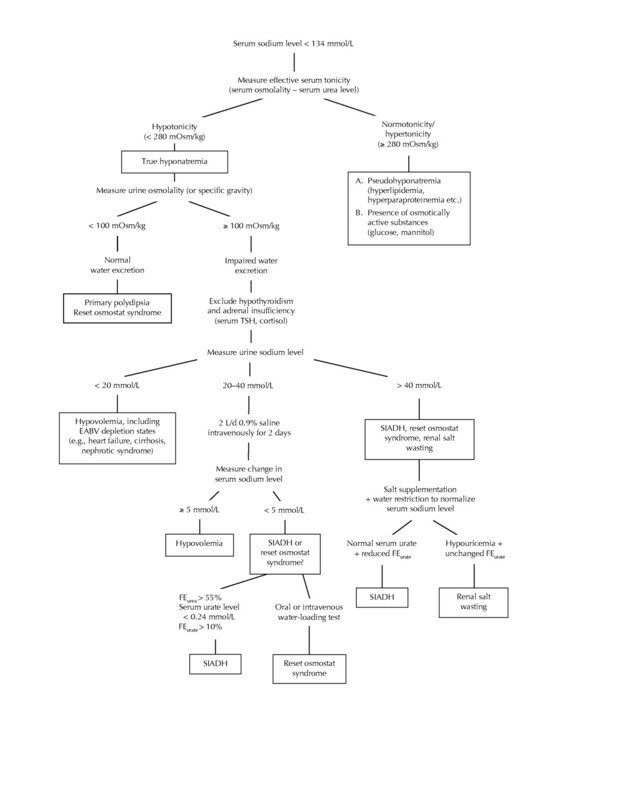 1: Clinical diagnostic algorithm for hyponatremia. TSH = thyroid-stimulating hormone, EABV = effective arterial blood volume, SIADH = syndrome of inappropriate secretion of antidiuretic hormone, FE = fractional excretion. The step-by-step diagnostic evaluation of hyponatremia is shown in Fig. 1. In the presence of osmotically active substances (e.g., patients with hyperglycemia or those receiving mannitol infusions), an increase in serum osmolality is observed, which results in movement of water out of the cells and subsequently a reduction of the serum sodium level by dilution. It has been calculated that every increase of 3.4 mmol/L in the serum glucose level will draw enough water out of the cells to reduce the serum sodium concentration by 1 mmol/L (i.e., a decrease of 1.6 mmol/L in the serum sodium level per increase of 5.6 mmol/L in the glucose level).6,9 However, recent evidence suggests that the hyperglycemia-induced decrease in sodium concentration is considerably higher than the “standard” correction factor of 1.6, especially when glucose levels are greater than 22.2 mmol/L.10 Hillier and colleagues10 have proposed that a correction factor of 2.4 mmol/L is a better overall estimate of the association between sodium levels and glucose levels. Decreased urine osmolality is also observed in some patients with reset osmostat syndrome, when water intake reduces the serum osmolality below the new threshold for ADH release.16 Reset osmostat syndrome (discussed in a separate section later in this article) is a variant of the syndrome of inappropriate ADH secretion (SIADH) and is present in about one-third of patients with SIADH. In patients with hyponatremia and inappropriately concentrated urine, it is particularly important to assess the effective arterial blood volume.11 A decreased volume is by far the most common cause of hyponatremia in everyday clinical practice. Hypovolemia can be determined clinically by the presence of postural changes in blood pressure and pulse rate. Measurement of urine electrolyte levels is also extremely useful in the assessment of effective arterial blood volume, since patients with volume depletion exhibit low urinary excretion of sodium and chloride (sodium level less than 20 mmol/L, chloride level less than 20 mmol/L).2,11,17,18 A urine sodium level less than 20 mmol/L in hypovolemia is relevant if renal salt wasting does not exist.19 On the other hand, an increased urine sodium level is usually observed in patients with euvolemic hyponatremia (urinary sodium level greater than 40 mmol/L). However, the urine sodium concentration in euvolemic hyponatremia may be less than 20 mmol/L when dietary sodium intake is low. Serum composition can also be used to assess the effective arterial blood volume. In fact, urea is particularly sensitive to hypovolemia. Thus, in patients with a normal serum creatinine level, an increase in serum urea levels (and therefore in the urea:creatinine ratio) suggests hypovolemia, whereas a decrease in serum urea levels is indicative of an increase in extracellular volume.11,24 In fact, a low serum urea concentration is frequently reported in patients with SIADH, in whom the volume is somewhat expanded.25,26,27 Musch and associates23 found that hyponatremic patients presenting with decreased FENa+ (less than 0.5%) combined with decreased fractional excretion of urea (less than 55%) responded successfully to the administration of normal saline, signifying a decrease in effective arterial blood volume (Fig. 1). Similarly, serum uric acid levels may be used in the differential diagnosis of hyponatremia.19,25,26,27,28 It has been reported that patients with hypovolemia tend to exhibit increased serum uric acid levels (greater than 0.3 mmol/L).25 In contrast, in patients with SIADH, serum uric acid levels are actually depressed (less than 0.24 mmol/L).19,28 This decrease in serum uric acid levels typically results from an increase in urate excretion (fractional excretion of urate greater than 10%). Hyperuricuria has been attributed to water retention and the resultant expansion of serum volume, which, in turn, leads to reduced sodium and urate reabsorption.19,25,26,27,28 However, it remains questionable whether volume expansion per se is a major determinant that causes a significant increase in urate excretion rates in humans.29 In fact, there is evidence that hypouricemia related to high urate clearance may also be encountered in some hypovolemic patients who exhibit cerebral salt-wasting syndrome30 (this syndrome is discussed in a separate section later in this article). Contributors: All 3 authors contributed substantially to the manuscript. They were all involved in drafting and revising the article, and all approved the final version of the manuscript. Rose BD. New approach to disturbances in the plasma sodium concentration. Am J Med 1986;81:1033-40. Kumar S, Beri T. Sodium. Lancet 1998;352:220-8. Gross P, Hensen J. Evaluation of hyponatremia: Is there a rational approach? Nephrol Dial Transplant 1995;10:1789-91. Fraser CL, Arieff AI. Epidemiology, pathophysiology, and management of hyponatremic encephalopathy. Am J Med 1997;102:67-77. Adrogue HJ, Madias NE. Hyponatremia. N Engl J Med 2000;342:1581-9. Mange K, Matsuura D, Cizman B, Soto H, Ziyadeh FN, Goldfarb S, et al. Language guiding therapy: the case of dehydration versus volume depletion. Ann Intern Med 1997;127:848-53. Weisberg LS. Pseudohyponatremia. A reappraisal. Am J Med 1989;89:315-8. Maas AHJ, Sigaard-Andersen O, Weisberg HF, Zijlstra WG. Ion-selective electrodes for sodium and potassium: a new problem of what is measured and what should be reported. Clin Chem 1985;31:482-5. Katz MA. Hyperglycemia-induced hyponatremia: calculation of expected serum sodium depression. N Engl J Med 1973;289:843-4. Hillier TA, Abbott RD, Barrett EJ. Hyponatremia: evaluating the correction factor for hyperglycemia. Am J Med 1999;106:399-403. Rose BD. Hypoosmolal states — hyponatremia. In: Rose BD, Post TW, editors. Clinical physiology of acid-base and electrolyte disorders. 5th ed. New York: MacGraw Hill; 2001. p. 696-745. Gillum DM, Linas SL. Water intoxication in a psychotic patient with normal water excretion. Am J Med 1984;77:773-4. Hilden T, Svendsen TL. Electrolyte disturbances in beer drinkers. A specific “hypoosmolality syndrome.” Lancet 1975;7928:245-6. Thaler SM, Teitelbaum I, Berl T. “Beer potomania” in non-beer drinkers: effect of dietary low solute intake. Am J Kidney Dis 1998;31:1028-31. Liamis GL, Milionis HJ, Rizos EC, Siamopoulos KC, Elisaf MS. Mechanisms of hyponatraemia in alcohol patients. Alcohol Alcohol 2000;35:612-6. Lipschutz JH, Arieff AI. Reset osmostat in a healthy patient. Ann Intern Med 1994;120:574-6. Chung HM, Kluge R, Schrier RW, Anderson RJ. Clinical assessment of extracellular fluid volume in hyponatremia. Am J Med 1987;83:905-8. Milionis HJ, Elisaf MS. Hyponatraemia in a patient with hepatic cirrhosis. Nephrol Dial Transplant 1999;14:787-9. Beck LH. Hypouricemia in the syndrome of inappropriate secretion of antidiuretic hormone. N Engl J Med 1979;301:528-30. Sonnenberck M, Friedlander Y, Rosin AJ. Diuretic induced severe hyponatremia: review and analysis of 129 reported patients. Chest 1993;193:601-6. Danovitch GM, Bourgoignie J, Bricker NS. Reversibility of the “salt-losing” tendency of chronic renal failure. N Engl J Med 1977;296:14-9. Sherman RA, Eisinger RP. The use (and misuse) of urinary sodium and chloride measurements. JAMA 1982;247:3121-4. Musch W, Thimpont J, Vandervelde D, Verhaeverbeke I, Berghmans T, Decaux G. Combined fractional excretion of sodium and urea better predicts response to saline in hyponatremia than do usual clinical and biochemical parameters. Am J Med 1995;99:348-55. Elisaf MS, Milionis HJ, Siamopoulos KC. Electrolyte abnormalities in elderly patients admitted to a general medical ward. Geriatr Nephrol Urol 1991;7:73-9. Decaux G, Schlesser M, Coffernils M, Prospert F, Namias B, Brimioulle S, et al. Uric acid, anion gap and urea concentration in the diagnostic approach to hyponatremia. Clin Nephrol 1994;42(2):102-8. Elisaf MS, Milionis HJ, Drosos AA. Hyponatremia due to inappropriate secretion of antidiuretic hormone in a patient with systemic lupus erythematosus. Clin Exp Rheumatol 1999;17:223-6. Liamis G, Elisaf M. Syndrome of inappropriate antidiuresis associated with multiple sclerosis. J Neurol Sci 2000;172:38-40. Maesaka JK. An expanded view of SIADH, hyponatremia and hypouricemia. Clin Nephrol 1996;46:79-83. Maesaka JK, Fishbane S. Regulation of renal urate excretion: a critical review. Am J Kidney Dis 1998;32:917-33. Tanneau RS, Moal MC, Rouhart F, Dueymes JM, Bourbigot B. Hypouricemia with high urate clearance in hyponatremia: Is it always a clue for increased effective volemia? Clin Nephrol 1995;44:128. Davison JM, Shiells EA, Phillips PR, Lindheimer MD. Influence of humoral and volume factors on altered osmoregulation of normal human pregnancy. Am J Physiol 1990;258(4 Pt 2):F900-7. Linas SL, Berl T, Robertson GL, Aisenbrey GA, Schrier RW, Anderson RJ. Role of vasopressin in the impaired water excretion of glucocorticoid deficiency. Kidney Int 1980;18:58-67. Hanna FW, Scanlon MF. Hyponatraemia, hypothyroidism and role of arginine-vasopressin. Lancet 1997;350:755-6. Graber M, Corish D. The electrolytes in hyponatremia. Am J Kidney Dis 1991; 18:527-45. Decaux G, Crenier L, Namias B, Gervy C, Soupart A. Normal acid-base equilibrium in acute hyponatremia and mixed alkalosis in chronic hyponatremia induced by arginine vasopressin or 1-deamino-8-D-arginine vasopressin in rats. J Lab Clin Med 1994;123:892-8. Elisaf MS, Milionis HJ, Siamopoulos KC. Chronic hyponatremia secondary to reset osmostat in a patient with advanced ovarian cancer. J Exp Clin Cancer Res 1996;15:313-4. Elisaf MS, Konstantinides A, Siamopoulos KC. Chronic hyponatremia due to reset osmostat in a patient with colon cancer. Am J Nephrol 1996;16:349-51. Palmer BF. Hyponatraemia in a neurosurgical patient: syndrome of inappropriate antidiuretic hormone secretion versus cerebral salt wasting. Nephrol Dial Transplant 2000;15:262-8. Nelson PB, Seif SM, Maroon JC, Robinson GA. Hyponatremia in intracranial disease: perhaps not the syndrome of inappropriate secretion of antidiuretic hormone (SIADH). J Neurosurg 1981;55:938-41. Wijdick EFM, Vermeulen M, ten Haaf JA, Hijdra A, Bakker WH, van Gijn J. Volume depletion and natriuresis in patients with a ruptured intracranial aneurysm. Ann Neurol 1985;18:211-6. Sivakumar V, Rajshekhar V, Chandy MJ. Management of neurosurgical patients with hyponatremia and natriuresis. Neurosurgery 1994;43:269-74. Al-Mufti H, Arieff AI. Hyponatremia due to cerebral salt-wasting syndrome. Combined cerebral and distal tubular lesion. Am J Med 1984;77:740-6. Tanneau RA, Pennec YL, Jouquan J, Le Menn G. Cerebral salt wasting in elderly persons [letter]. Ann Intern Med 1987;107:120. Maesaka JK, Gupta S, Fishbane S. Cerebral salt-wasting syndrome: Does it exist? Nephron 1999;82:100-9. Maesaka JK, Wolf-Klein G, Piccione JM, Ma CM. Hypouricemia, abnormal renal tubular urate transport, and plasma natriuretic factor(s) in patients with Alzheimer's disease. J Am Geriatr Soc 1993;41:501-6. Maesaka JK, Venkatesan J, Piccione JM, Decker R, Dreisbach AW, Wetherington JD. Abnormal urate transport in patients with intracranial disease. Am J Kidney Dis 1992;19:10-5.